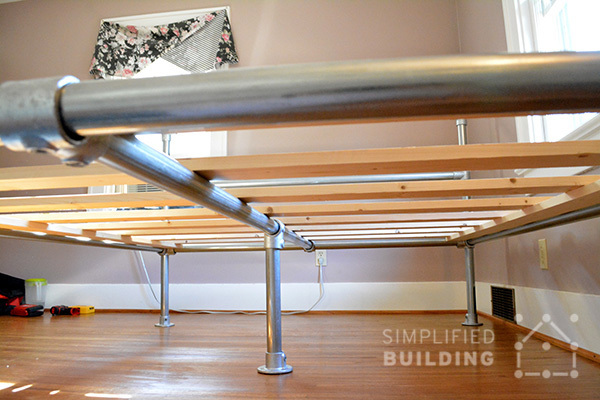 If you are looking to build a simple, durable and modern bed that will stand the test of time, try a Kee Klamp fittings and steel tube system (or aluminium, for a sleeker, lighter structure). 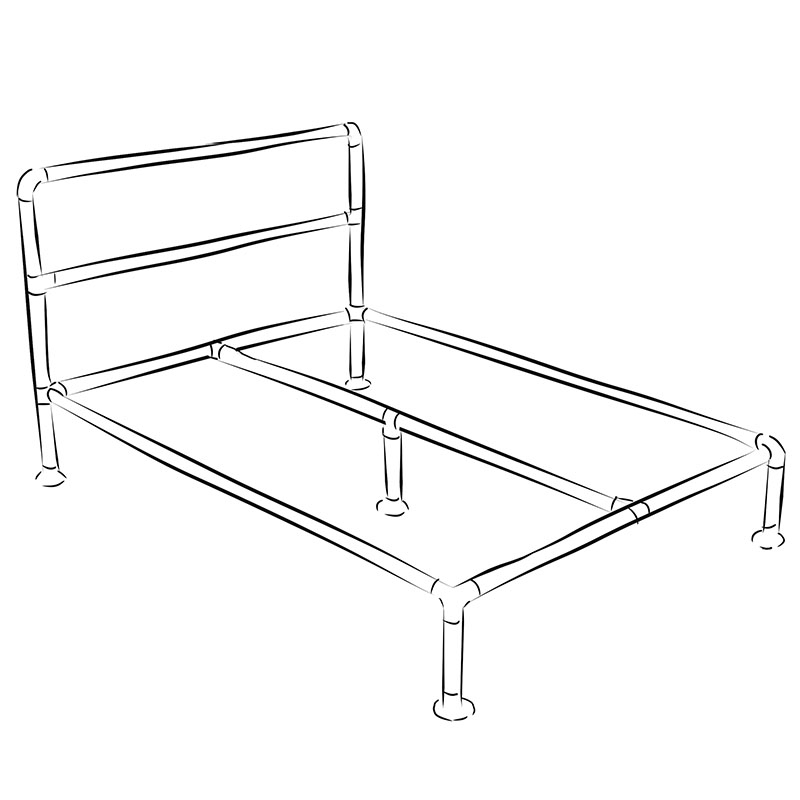 Our first ever bed frame kit – the Barbican Bed Frame – is made of galvanised Kee Klamp connectors and tube. 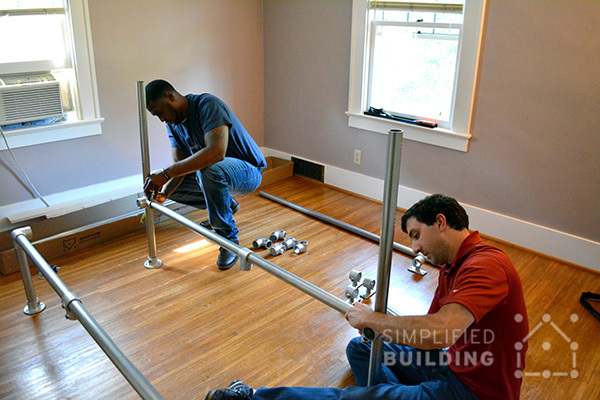 It comes in 4 sizes and can easily be put together by 2 people. 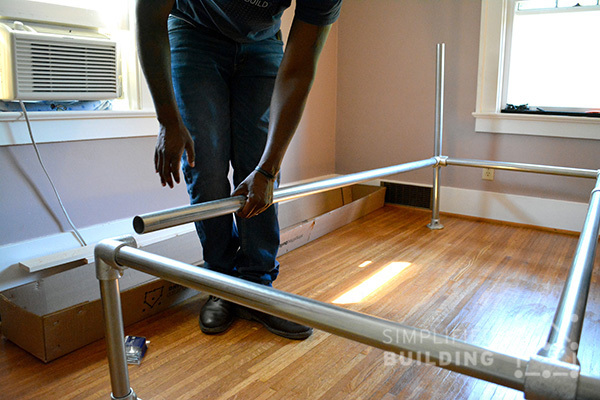 This blog post will show you how to build a Barbican standard double bed frame. 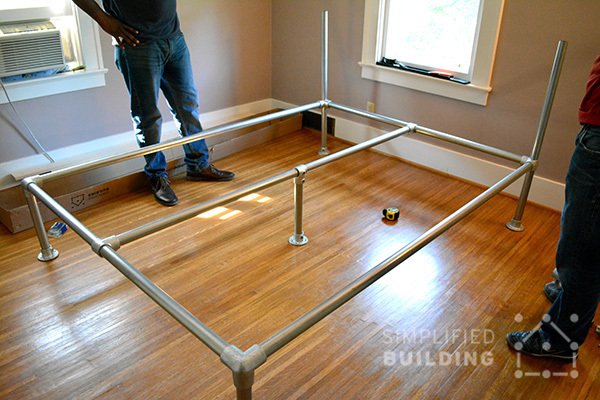 If you decide to buy the bed frame kit, this will come with all the fittings and tube that you need to put the frame together. 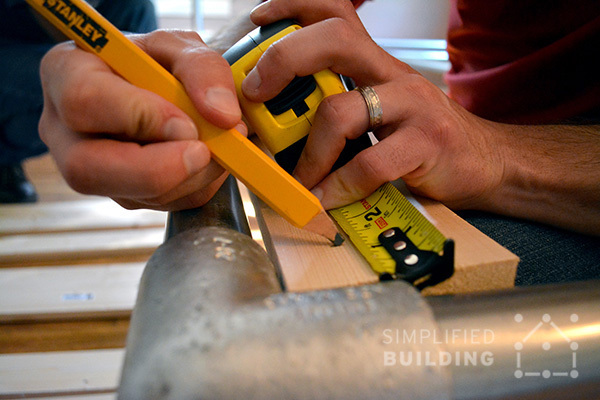 However, wood slats are not included with the kit, but we will show you how to build those below as well. 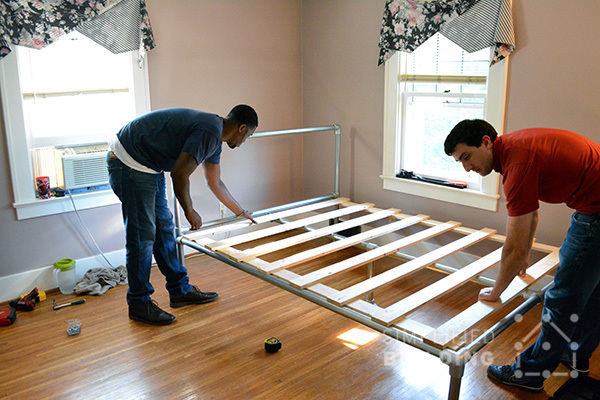 We recommend assembling the bed frame legs first and then continue with the frame in sections. 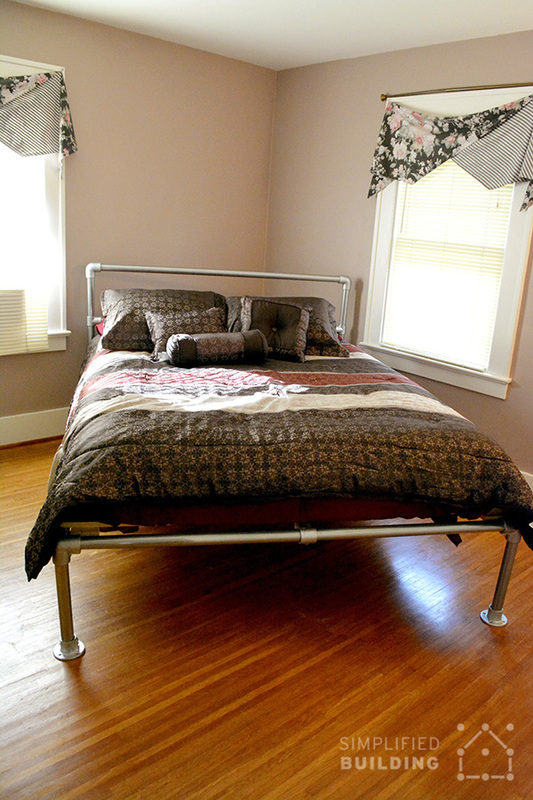 The bed frame legs for this bed are made of tube and flanges (61-6). 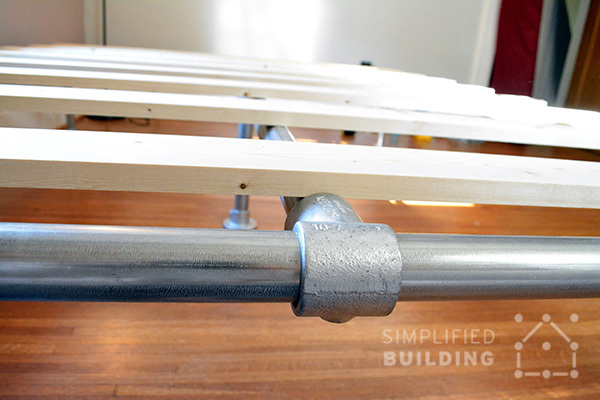 Attach the tube to the flanges to build the base for your bed. 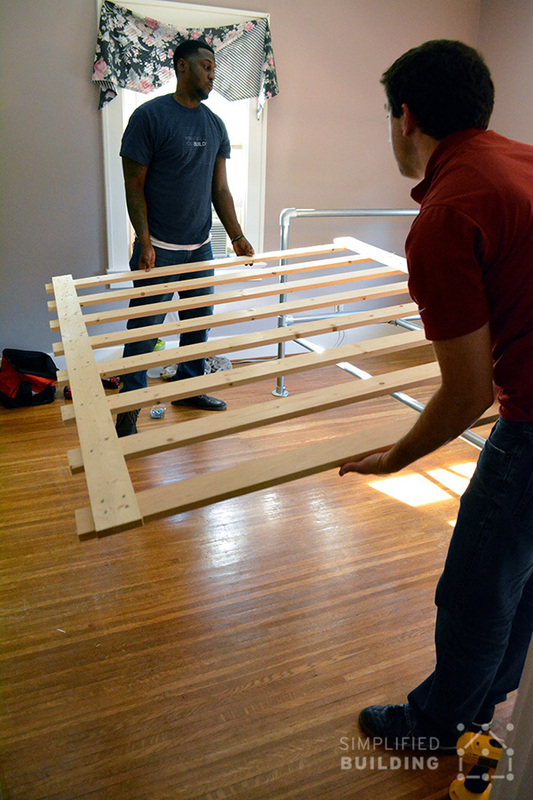 You will have 5 legs in total for a double bed; one of the legs will go in the middle to give the structure extra stability. 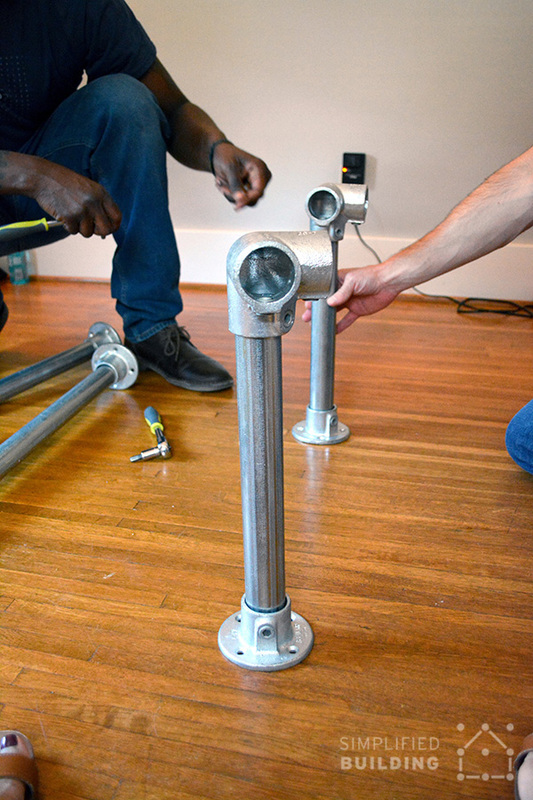 Tighten the flanges down using an Allen key. 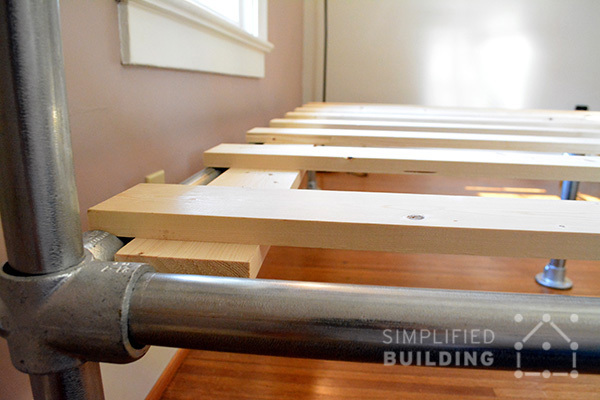 Attach the Side Outlet Elbows (20-6) to two of the short bed frame legs. 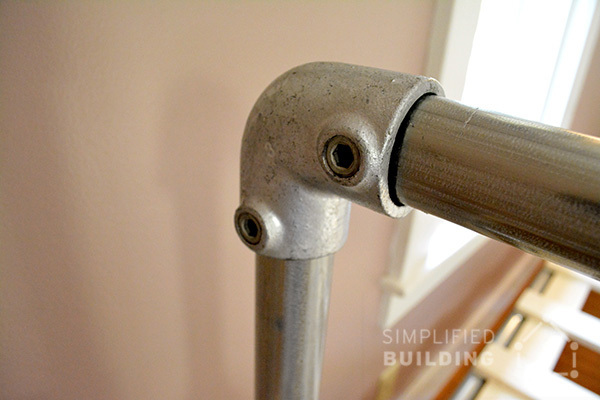 These fittings will help you connect the legs to the rest of the frame. 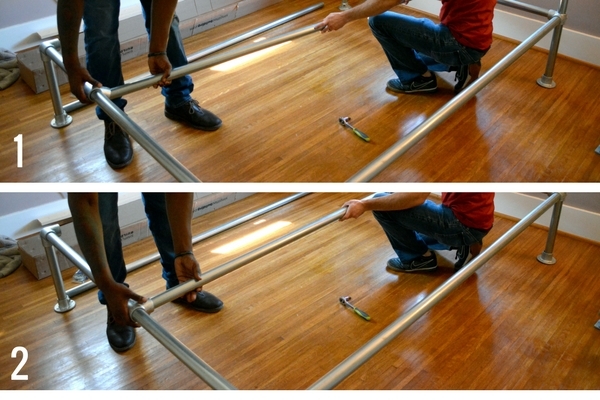 Use a 135 cm piece of tube to connect the front legs of the bed. 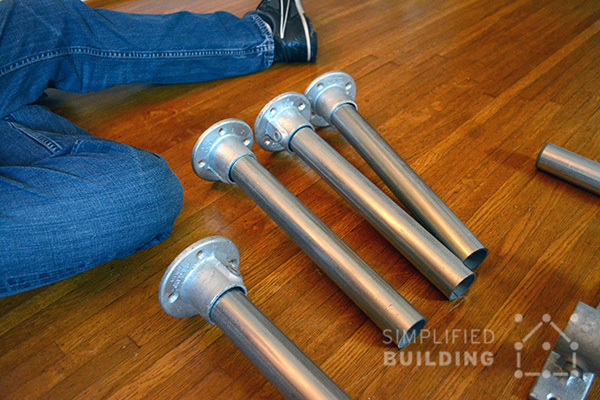 Before doing this though, slide one 10-6 fitting (Single Socket Tees) onto the tube, halfway through. 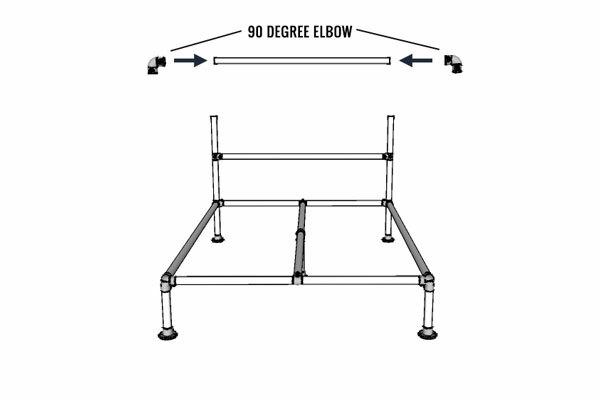 This will help you build the bed mattress support structure. 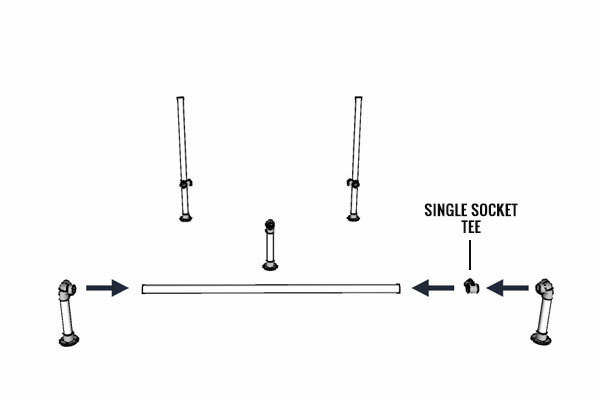 Attach the two 90 Degree Side Outlet Tee (21-6) fittings to the long legs. Position the fitting so that the screws are facing down if you want to make these less visible. 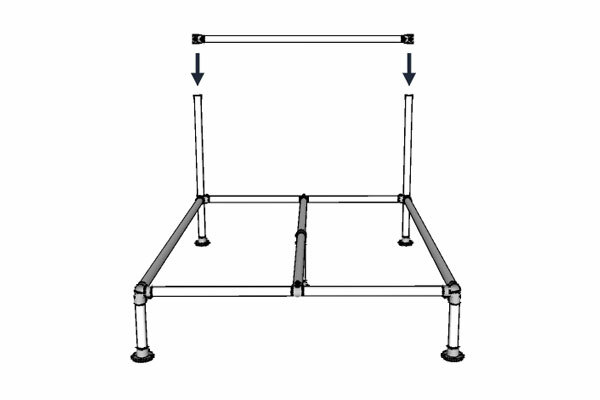 As with the short legs, make sure to insert one Single Socket Tee (10-6) onto the 135 cm piece of tube that will connect the long legs at the back of the bed. Place it half way through the tube. 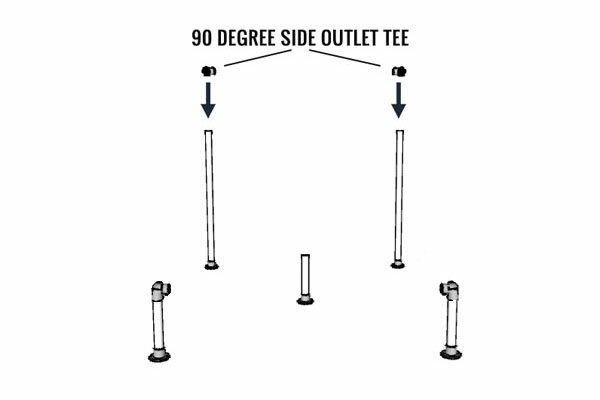 Then use the 90 Degree Side Outlet Tees to connect the legs together. 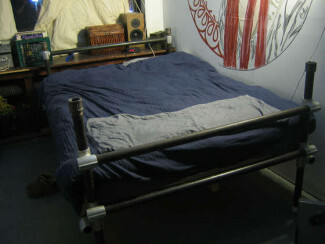 You can now use the 3 pieces of 190 cm to connect the front and back sections of the bed. Start with one side and work your way across. 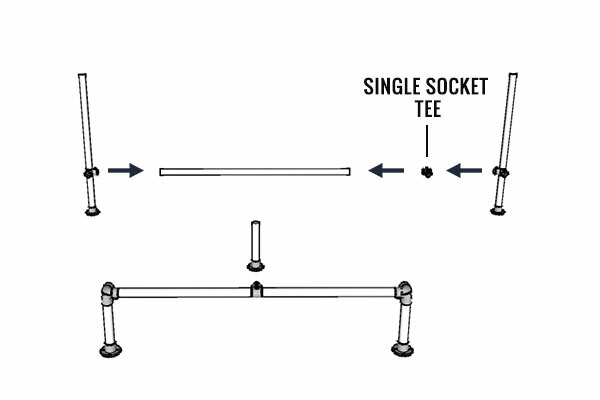 For the middle tube, make sure to add a Single Socket Tee (10-6) and slide it half way through. Do not tighten the fittings that connect these pieces of tubes yet. 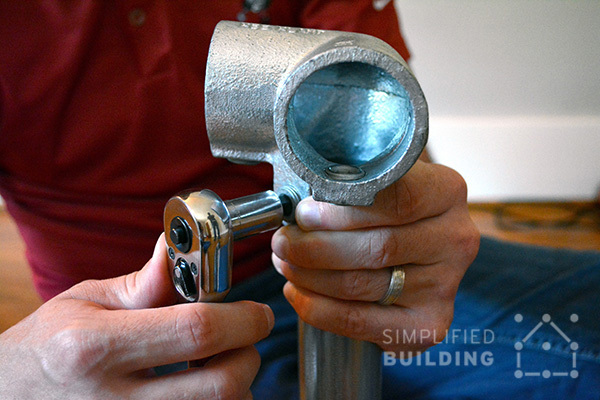 Insert all tubes into the fittings first and then tighten everything down. 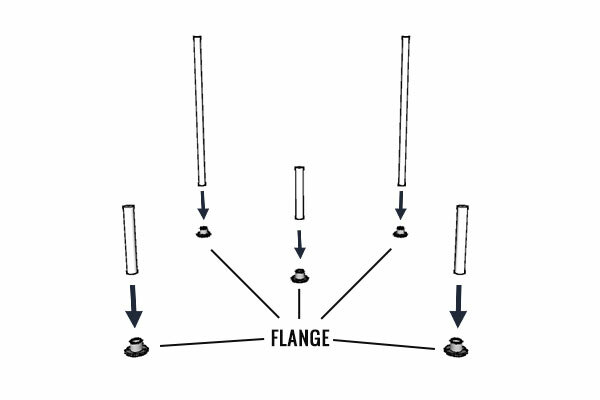 Make sure they are all aligned before doing this. 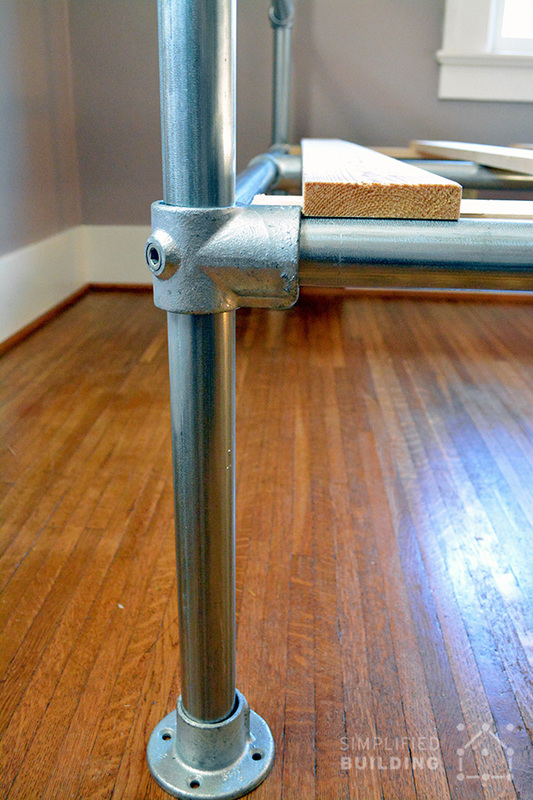 The middle leg will provide extra support to the frame. 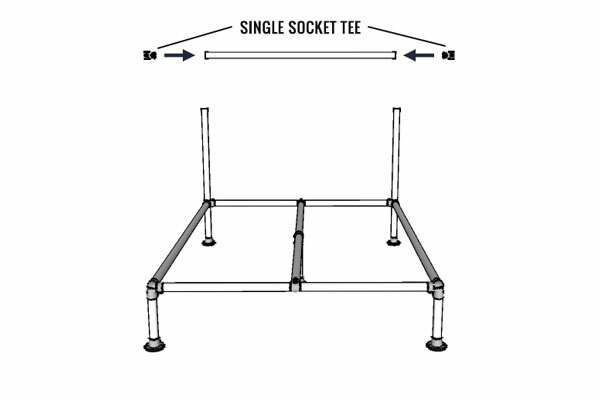 Lift up on the frame slightly in order to get the leg into the open socket on the Single Socket Tee. 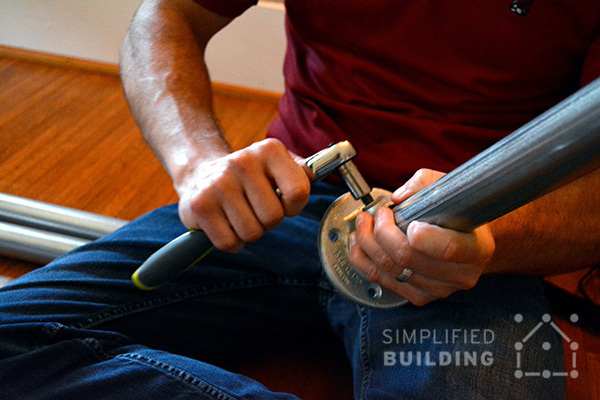 Once in place, tighten the set screw to secure the fitting to the tube. 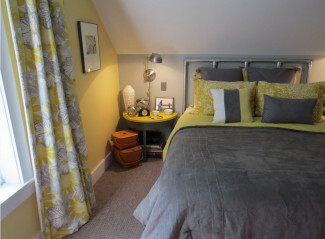 Slide two Single Socket Tees (10-6) onto each end of the bed long legs. You might want to not tighten these yet. 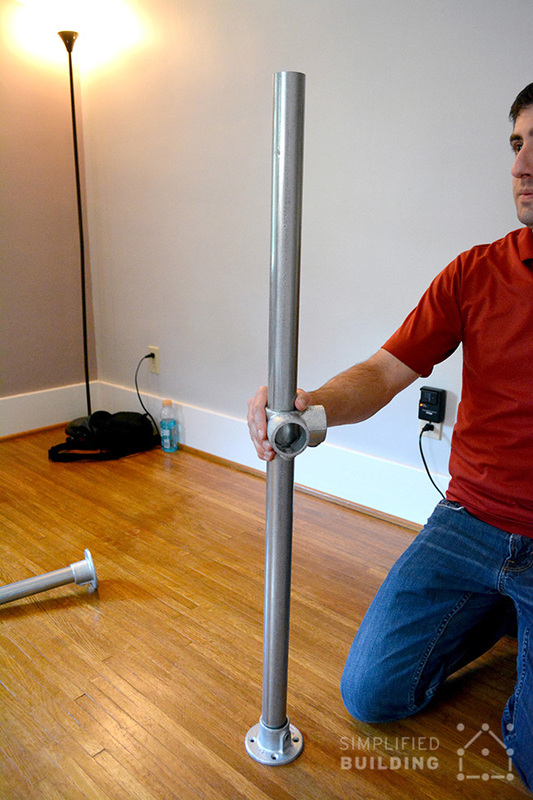 Insert a 135 cm piece of tube and make sure you position it properly before tightening everything down. 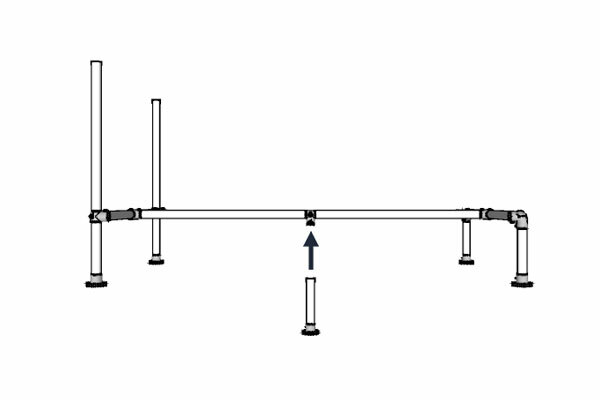 Next, insert two 90 Degree Elbows (15-6) at the end of a separate 135 cm piece of tube. Tighten the screws down. 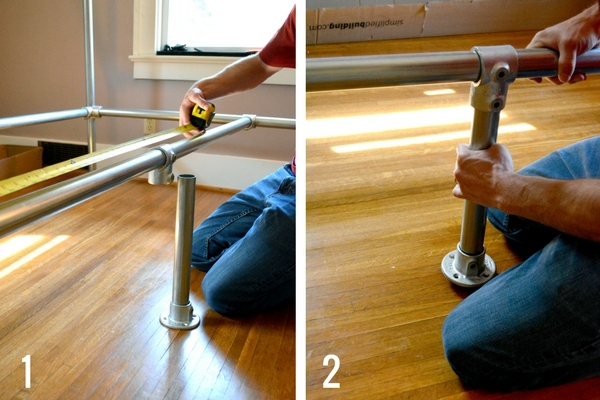 Then slide this piece of tube onto the ends of the long bed legs. 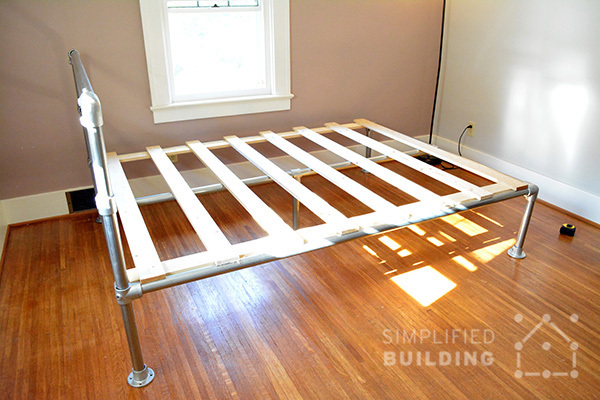 The Barbican bed frame kit does not come with the wood slats that will support your mattress. 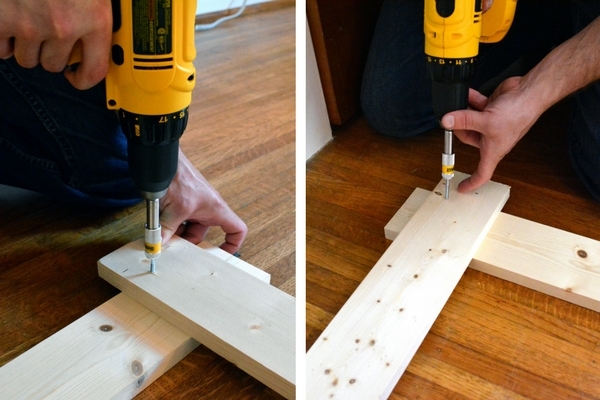 However, these are easy to DIY. 1. 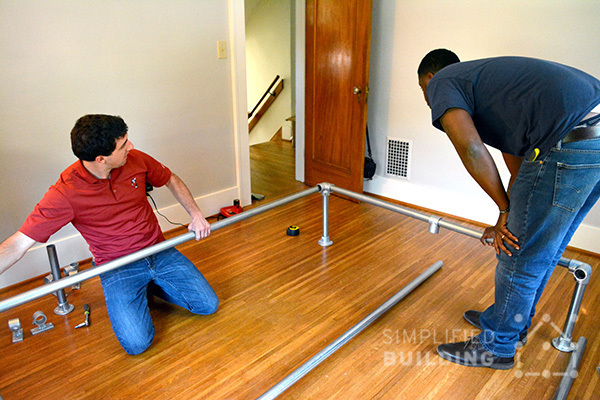 Do not build the slats before putting the frame together. 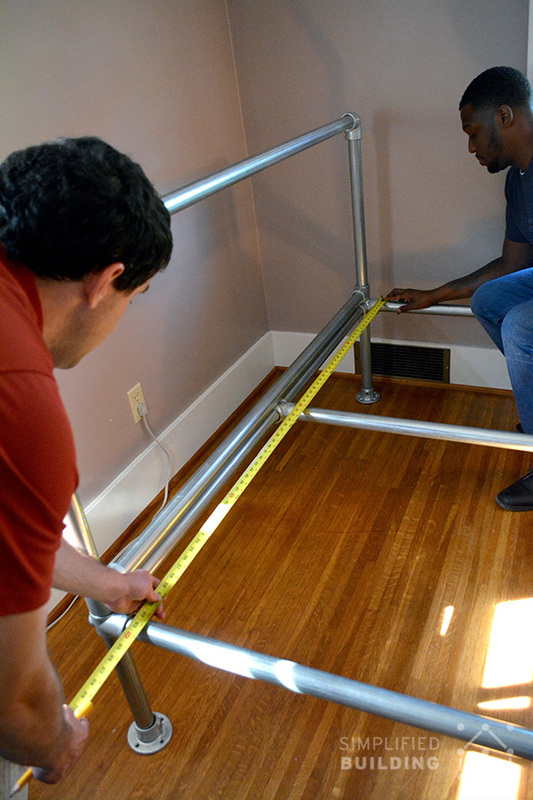 You need to measure everything AFTER you have put the frame together. 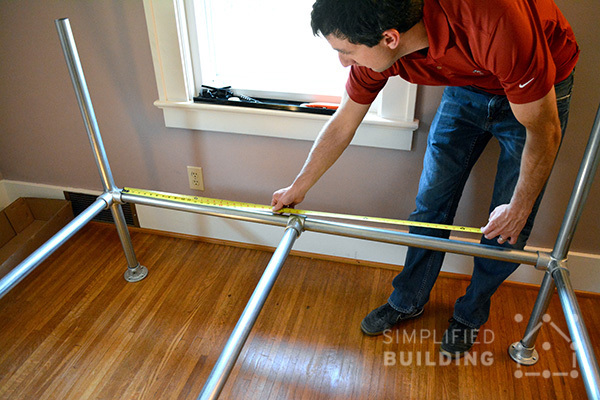 This way, you avoid measuring the structure incorrectly and ending up with the incorrect size of slats. 3. 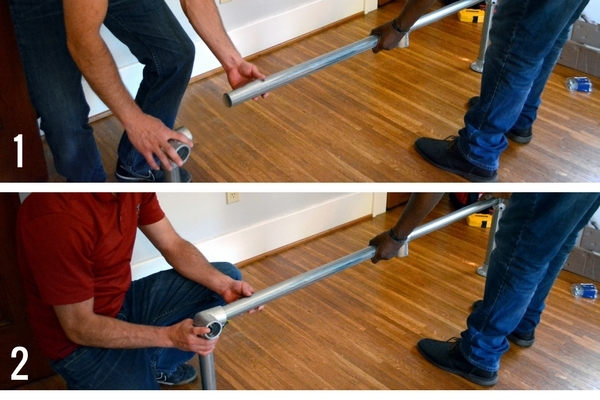 Measure from the outer edge of the tube on one side to the outer edge of the tube on the other, just as seen in the picture below. 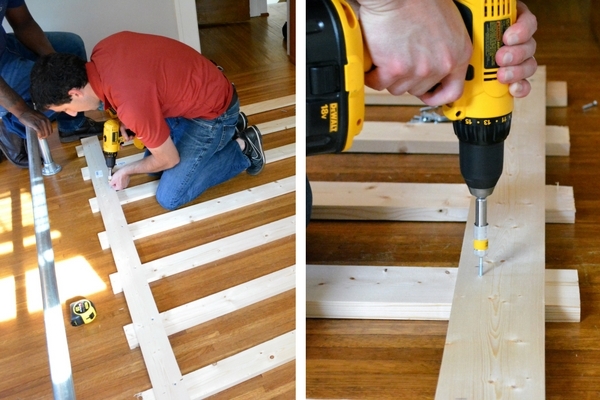 Then you can cut the width-wise slats down or have a DIY store do it for you (a lot of stores will do this for free when purchasing the wood from them). 4. 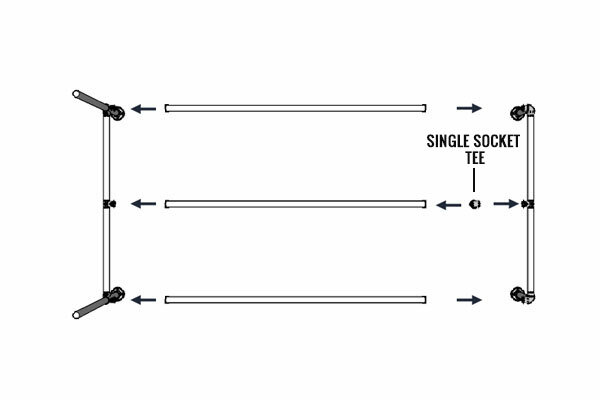 To find out how long the wood slats running length wise will need to be, measure from the inside edge of the Side Outlet Elbow fitting at front of the frame to the inside edge of the 90 Degree Side Outlet Tee at the back of the frame. 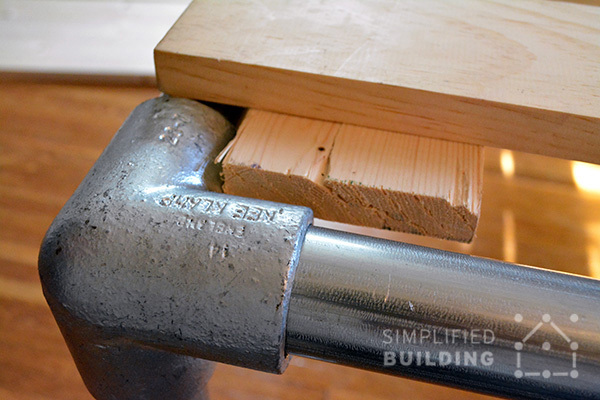 Then cut the slats to length. 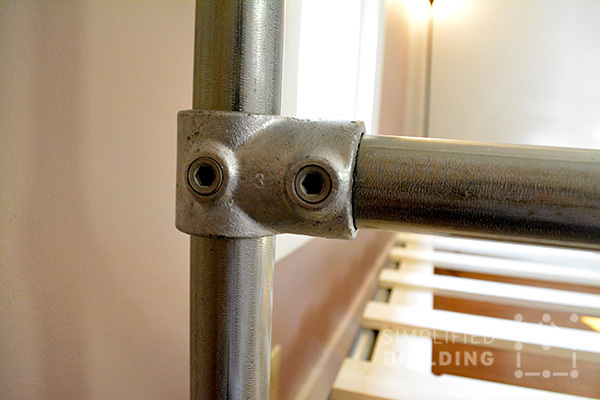 If you place this slat just inside the frame, it should rest up against the fitting at the corner of the frame on both sides. 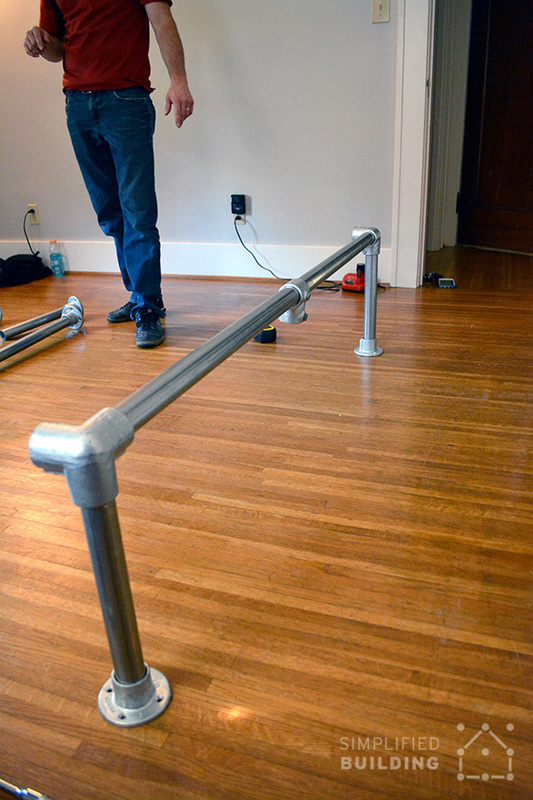 Then, mark where the slat meets the edge of the fitting as shown in the picture above. 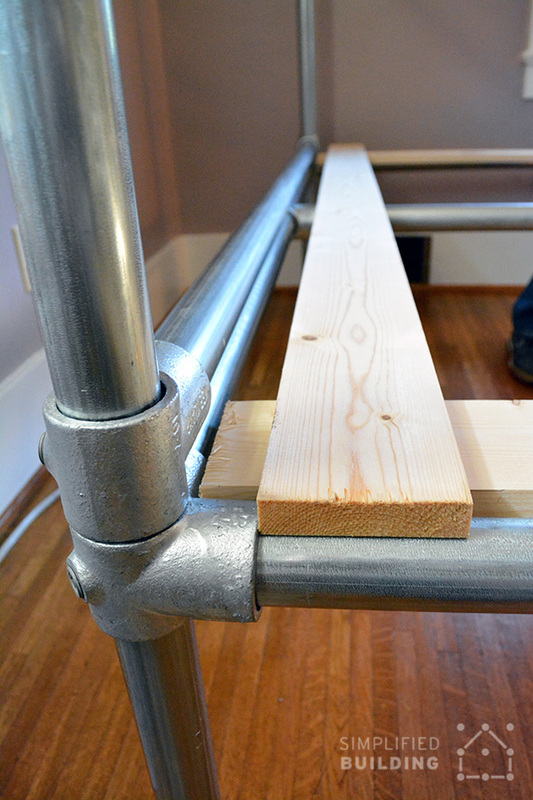 This will indicate where the first wood slat, running width wise, will need to be placed. 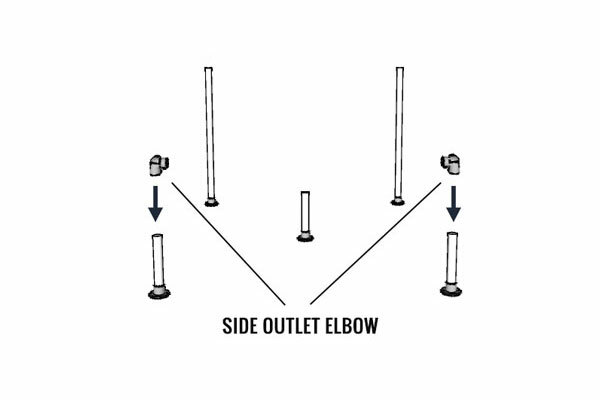 Do this on both sides and for both boards that will run length wise. 5. 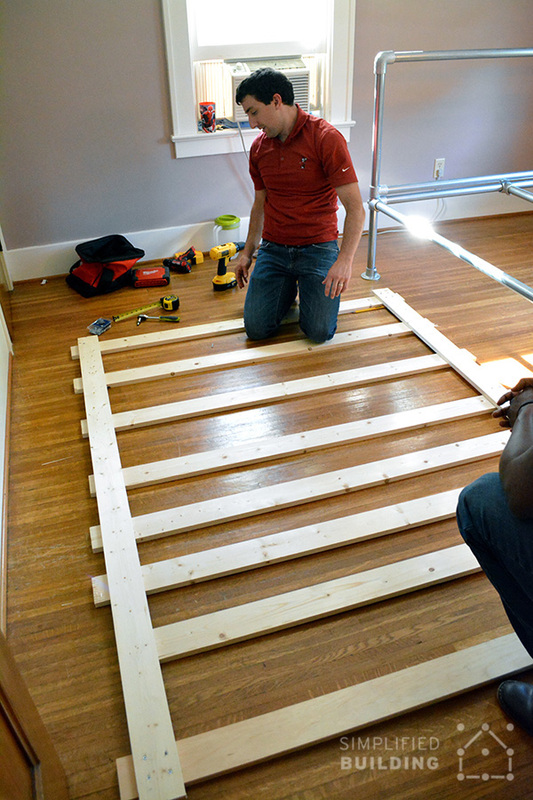 With the boards cut to length and marked, line them up so that they create a rectangle. 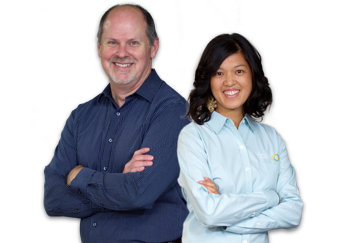 They should overlap each other as shown in the picture below. The pencil marks you made earlier will show you where to line them up. Place the boards right up against these lines. Do this for all four corners. 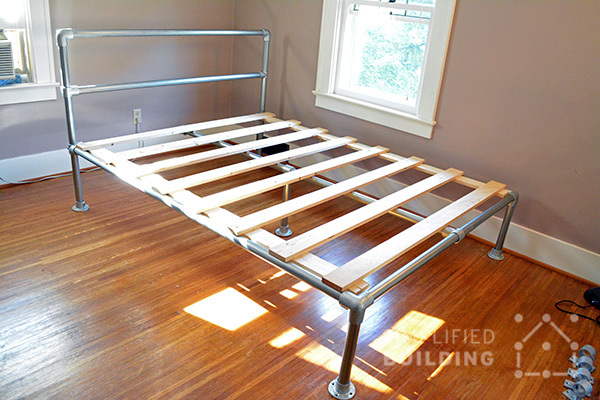 Build your own sturdy Kee Klamp king size bed just like designer Robin Amorello did. Here's how.